Let’s cut to the chase here. In the UK, mental health issues among young people are at worrying levels. 1 in 10 children and young people aged 5 – 16 suffer from a diagnosable mental health disorder – that is around three children in every class. And anxiety, worry, OCD and panic attacks are key players in that. So when I had the chance to interview the authors of Anxiety, Worry, OCD & Panic Attacks, The Defintive Recovery Approach: The Complete Guide for Your Family – a profoundly important book written from the dual perspective of a former sufferer, Adam Shaw, and the industry-leading psychologist, Lauren Callaghan, that helped him reach recovery, of course I jumped at the chance. Because quite frankly, if there’s one thing we need, it’s more dialogue about the struggle that is children’s mental health, and what we can to support them in it as parents and carers. So let us begin…. Can you share from your own experiences what suffering with anxiety and OCD as a child is like? Adam: On the outside and to everyone else, I was fine, but on the inside I felt really sad. They weren’t just worries, it was a nagging feeling of unease that would creep up on me as soon as I opened my eyes in the morning- it made me want to cry! Adam – In hindsight, what do you wish you had known about anxiety and OCD as a child? Adam: More than anything I wish that I knew I wasn’t alone! If I had known that what I had was anxiety and OCD then I probably wouldn’t have worked so hard to hide my thoughts (and in turn developing more rituals). I think spending the best part of 20+ years trying to hide what I was thinking ultimately led to the massive breakdown I had in my 30s when I was stood on the end of a bridge in Sheffield! If you’ve read our books on OCD and anxiety, then you will know how despairing a journey my adult life was… until I met Lauren. What can parents do to help pinpoint if their child is struggling with anxiety or OCD? Lauren: Ask them what is going on, and observe them (not in an overbearing way! Just trust your parental intuition). Anxiety and OCD can present in unusual ways so if you think something is going on, it would be worth seeking the opinion of a qualified professional (clinical psychologist or a psychiatrist for example). 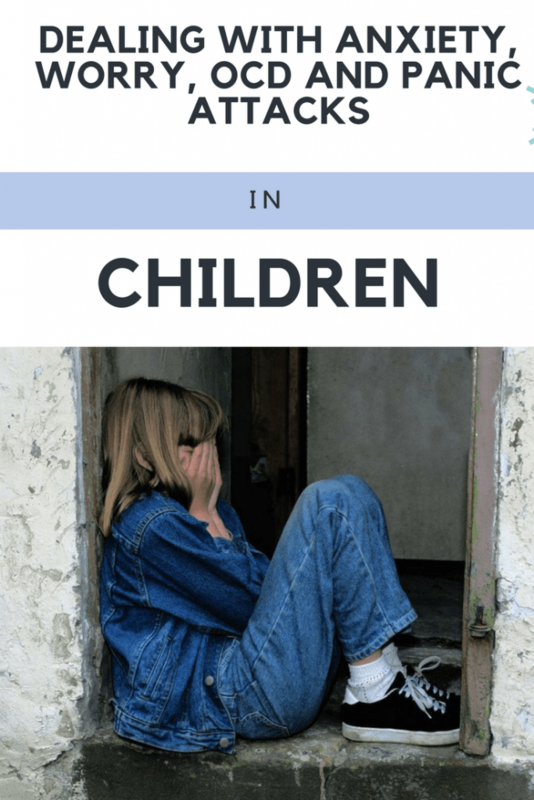 Don’t worry if you can’t diagnose it yourself, you will know that something is going on for your child and they are not themselves and that is the most important part. Then a professional can help all of you understand what is going on, and present treatment options. A GP will also help send you to the right place. Adam: Lauren is absolutely spot on, parents will notice that something is not quite right. Seeking professional help is vital. Parents can also help by just being as supportive as possible, if their child has been diagnosed as a sufferer of OCD then trying to understand that illness, whether it be through reading books, blogs, or watching documentaries, would be hugely helpful. With 6 in 10 children not getting help for problems like anxiety, what do we need to do to help those young people not getting the attention they need? Lauren: In my opinion we need to teach positive mental health in schools as part of the curriculum. Children could take part in understanding things like anxiety and fear, and learn strategies to help make them more resilient and improve their mental wellbeing. On a larger scale, we need (A LOT) more resources available to tackle mental health problems in children – in schools, GP clinics, and local mental health services for young people and their families. Adam: My problem was that there was no support or understanding for my illness in school. Early intervention is vital! We need to create an environment for children in school to open up and talk about their thoughts and feelings. Teaching positive mental health in schools, just like they do physical education, is the best way to do so. Do you think it’s possible to cure anxiety/OCD completely? What avenues would you recommend for young people? Lauren: Yes. But this is not always possible and that is OK too because we can significantly reduce the distress and interference it causes. Young people need to first speak to someone they trust to get advice on the best way forward. There are a lot of options these days including self help books (like ours), computerised treatment programmes, and individual therapy. Adam: Of course you can be cured completely, but the fight requires dedication and determination, all of which you gain from having a good support network of friends and family. I, myself, would say that I am not 100% completely cured, but I just know how to handle my illness now and I also know that I am well on my way to being completely free of it. I would not have done that without the professional help of Lauren, which I know is not accessible to all. That is why we have developed these self-help books from the perspective of both the sufferer and a world-leading psychologist. We want to bring the expertise of amazing psychologists like Lauren to every single home that needs it! What words of advice do you have to give to those parents who think their child might be suffering from anxiety and/or OCD? Lauren: Don’t blame yourself. It is not your fault and your child will need you now more than ever, so look at it like a team challenge. Also do not look for a miracle treatment. Get a professional diagnosis and treatment plan – there are very effective treatments available, and you should be involved in the treatment and help your child overcome their problems. For example our book is designed for both children and their parents as we know that parents are the most important person to help their child overcome anxiety and OCD. Adam: Firstly, do not ignore it! Get a professional opinion. I also think the best thing to do would also be to encourage your child to speak up about the thoughts he/she is having- opening up an honest dialogue could be more of a relief for your child then you know. But do not react badly to these thoughts, OCD sufferers never actually carry out any of the thoughts that they have. Adam: To all the anxiety/OCD child sufferers out there – you are not a danger to people! In fact, OCD and anxiety sufferers tend to be the most caring people, that is why they worry so much about carrying out their thoughts. My story was distressing, dark and at times I was severely depressed- but I truly believe that if we invest in educating children in school about maintaining positive mental health then stories like mine can be avoided. Please sign our petition to make mental health education compulsory in primary and secondary schools here. Anxiety, Worry, OCD & Panic Attacks, The Defintive Recovery Approach: The Complete Guide for Your Family is available at Amazon. All the proceeds from the book will go to its partner charity the Shaw Mind Foundation. I completely agree that teaching positive mental health in schools is highly underrated and must become a necessity if improvement. Kids tend to be extremely insecure especially if they feel there is something different within themselves and so often they can feel so secluded within their own mind that instead of telling someone and knowing that they aren’t alone they hide it and feel all the more alone. Great article, a lot of good content and thought provoking material. Thanks for sharing. You’ve probably heard this before, but listen up: Exercise is incredibly valuable, not only for general health, but for its mood-boosting effects, too. You don’t need to run a marathon to reap the benefits of exercise. If needing help never be scared to ask. It’s a psychiatrist job to help you. Anxiety is interesting, because it tends to get worse when you try to fight it. It’s not clear why that occurs, but most likely the stress that your body goes through in order to control the stress of anxiety only makes it worse, as does the effort it takes to try to not feel your natural feelings. Anxiety and its impacts are not only associated with the irrationality of thoughts, feeling of loneliness or timely nervousness. However, anxiety is a broader term which is capable of impacting your bodily functions. Be it children or adults. I believe everyone deserves to get help with it.